After a long weekend out with friends (visiting Arundel Castle of all places) I've done some more work on the homemade telescope mount project. After testing the entire system over the long Easter weekend, I dismantled the mount and did some painting and final adjustments. Today I've rebuilt the mount in the shed. Although it is easier to construct these things in the workshop, it is beyond me to move the entire mount in one go. It weights in around 35kg. 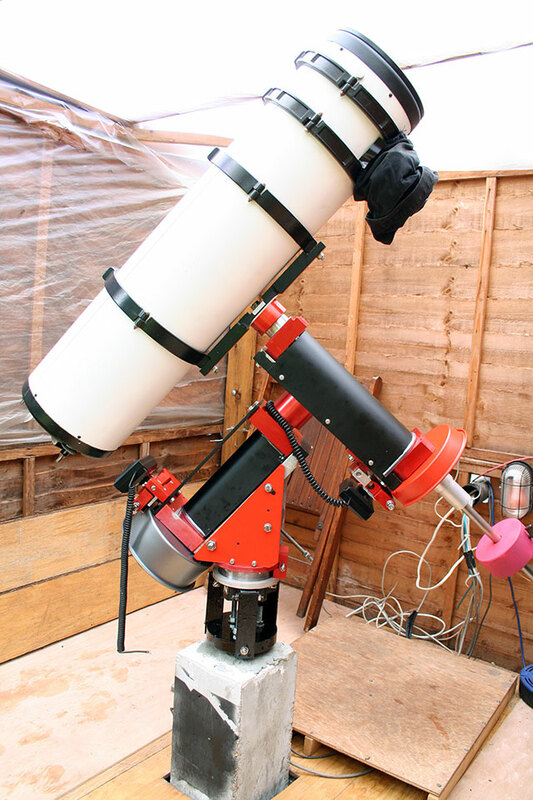 Although it is raining a bit today, I've got on quite well and got the whole mount put together and the telescope attached. Next step is re-wiring. Lots of options here - I must keep it tidy! First picture here is the scope in the shed. Second picture is the parts of the scope prior to putting it all back together. You can now see the various covers I have fabricated from 1mm aluminium sheet. I do not sheet metalwork at the best of times, but it is important to cover the shafts with something. The shafts of the telescope mount are made from specially hardened steel, but it is not stainless steel, so it will corrode over time. To prevent corrosion, I've covered the shafts in thick protective grease. The shaft covers are required to prevent dirt and dust sticking to this grease, and to prevent the grease getting on the astronomer! The covers have been painted a simple matt black and fixed with stainless steel screws so they can be easily removed for telescope mount inspection and maintanence. You can also see the circular covers on the worm wheels. The greasy worm wheels are made from aluminium which corrodes less than steel, but still needs protecting to prevent dirt. The covers also give a level of physical protection to prevent accidently knocking the delicate edges of the worm wheels. These round covers may appear a little odd. The reason for this is that I couldn't face the idea of making something like that, so I simply purchased a couple of cheap cake tins. These round baking tins from a kitchen shop were the perfect size to make worm wheel covers! What's the point of training your mount to reduce PEC which is effectively taken out when you autoguide anyway? PEC stands for “periodic error correction”. PE is “periodic error”. As you say recall from my photos, those big worm wheels (7, 8 or 11 inches in your case!) are turned by a small threaded shaft called a worm gear, with a diameter of about 20-30mm. The worm gear is turned at a constant rate. If the worm gear (the little threaded shaft) is perfect, then the mount will track in RA perfectly. That threaded shaft is held at each end by two bearings. These bear on a flat part of the shaft. But, however good you are at machining, the flat part of the shaft will never be perfectly concentric with the threaded bit. Now, that slight eccentricity results in the speed of the tracking to go over-speed or under-speed in a cycle. If the worm shaft is well made, this error will be smooth, and highly predictable. For a 360 tooth gear it will repeat every 86164/360 = 239.3 seconds. A paramount ME is 576 teeth, so 149.6 seconds. This is the gross error arising from the gears in the drive chain. Higher frequency error can also be superimposed over this low frequency cycle due to reductions gears closer to the motor, but ignore that for a moment. •	Higher frequency periodic errors. These have different periods. Go play with an FFT program if you want to analyse them. 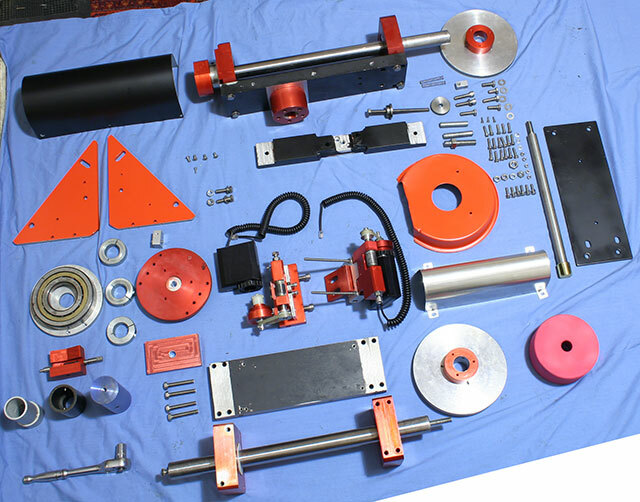 If the periodic error arising from the gross eccentricity of the worm shaft is both smooth and predicable, then periodic error correction will reduce the strain on the autoguiding system and therefore make things better. Think of PEC as correcting tracking errors before they have occurred, unlike autoguiding which can only correct error after it has occurred, the former is obviously preferred. The PEC is also averaging and smoothing the correction over a few seconds instead of the autoguiding making a series of sharp correction every few seconds. However, if the PEC training is poor, or the periodic error is unpredictable due to poor engineering, the PE Correction will do a poor job. The autoguiding and the Periodic error correction will fight each other and produce an inferior result. You must always autoguide over longer exposures. The items in the list above dictate this. No mount can correct for transients and flex! With a good mounty, the PE will be smooth and regular, thus PEC will work well with autoguiding, but to be honest you are only going to visually notice the difference if you are imaging around 1”/pixel instead of your wide field stuff. That said, even in wide field, the better the tracking, the better the signal to noise ratio in the fine detail of nebs and galaxies, even if you can’t detect the drift by eye. In summary, if the mount is well made, PEC reduces the strain on the autoguiding and ultimately produces better SNR, but if the PE is unpredictable, or the guiding system poor (flexure, seeing etc) then the two will fight and cause a problem. Practically I would start with the autoguiding and play with PEC when your are bored one night in the full moon. After some recent tests with a pin hole on my CCD camera, I realised that the edges of my secondary mirror were causing a lot of stray light scatter in the big Newtonian imaging scope. More on the tests another day, but I didn't realise that the simple frosted glass sides of the telescope secondary mirror were reflecting a lot of light into the wrong place. This coincided with some observations made by Richard Crisp about problems with flat fields in a friends telescope to convince me that an unpainted and unshielded secondary was a very bad idea for the standard of imaging I'm hoping to reach this coming season. Painting the secondary mirror of a Newtonian tlescope is a pretty scary idea. 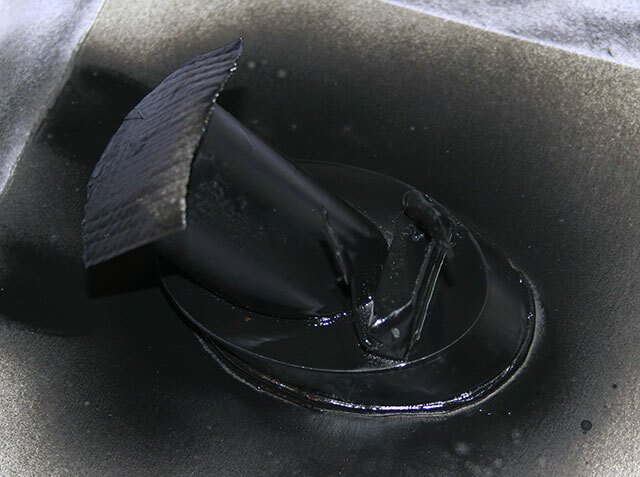 Certain parts of telescopes do not respond well to paint. Silvering of mirrors is quite high on this list. 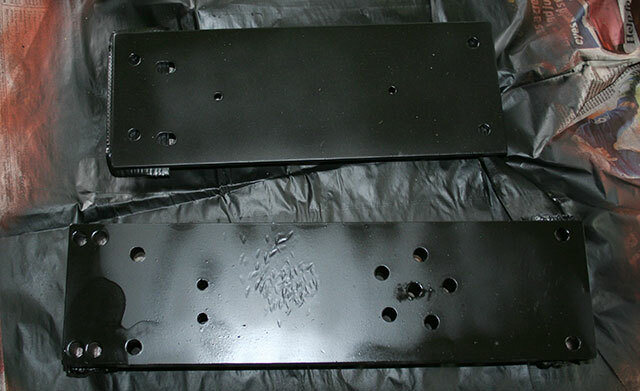 After selecting some slow drying black enamel spray paint I set about solving this this problem. My solution was to made a long sausage of blu-tak which I stuck around the rim of the silvered part of the mirror. I then laid this face down on a piece of thick card (one half of a birthday card) and pressed firmly. Hopefully this will work! I'm not too fussed about blu-tak on the silvering. That secondary mirror is 10 years old and the silvering is starting to come off and I'm generally well overdue for a new set of mirrors. Anyhow this approach seems to work - see the piccie! In a few days I will reinstall in the telescope tube and see what it looks like. Another long 4 day weekend here in the UK. Of course, the royal wedding was splendid and very tastefully done, but we can't keep partying all weekend, so I've been concentrating on painting the homemade telescope mount. As I have always said, it doesn't really matter what a telescope mount looks like, because nobody is going to see it, because it is dark! However, when you've spent 5 years (on and off, mostly off) making something, pride kicks in a little bit and you want to make it look pretty. People will come from far and wide (sometimes as far as the next village) to be impressed by the telescope mount. These folks will appreciate a bit of paint. Another factor is the weatherproofing. Unfinished machining grade aluminium doesn't respond well to years of exposure to the weather. It tends to become pitted and dirtied with a dusting of white aluminium oxide. Some grades of aluminium are less effected, but these are harder to work with in the workshop. Making a perfect job was never going to happen. Some of the aluminium parts have had a hard life in the workshop. Whilst I could spent a couple of days sanding and polishing every surface of every part of the mount, I'm not *that* fussed. A can or two of car paint is perfectly suited to giving the large aluminium parts a coat of paint. The small parts are of course anodised but I don't have the setup to anodise the larger parts. Whilst I could probably sort myself out with the required big bucket of acid, I don't really want to, so I will settle for some paint. 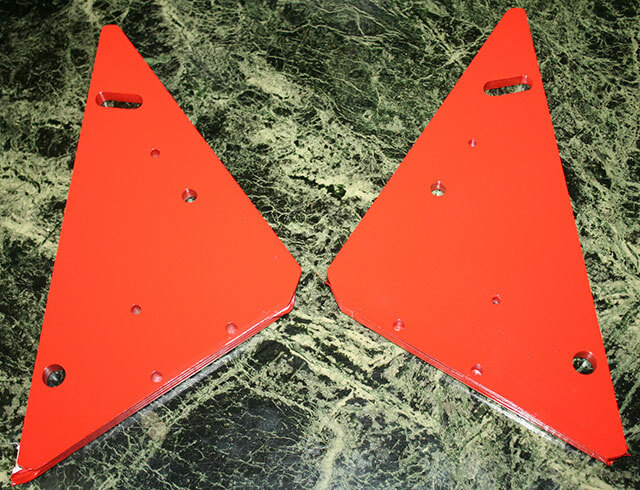 The first picture below are the two sides of the equatorial wedge part of the homemade telescope mount. In my on-going homage to the Paramount ME I've chosen red for these. A nice satin finish red. In case you were wondering, at some point in the past, one part got stuck in another part and I needed a lot of hammers to fix it. I'm also have a secret desire to get some part of it painted purple, but I don't know what yet. Anyhow, a couple of piccies. An interesting paper I've read recently which I thought worth sharing. Some interesting observations on secondary mirror supports in Newtonian telescopes, and designs for these supports which minimise the diffraction spikes in images of stars. I've often seen single arm supports and curly supports on commercial scopes, but I've not seen this approach before - although I'm sure it has been tried. I am also sure somebody will point one out to me. I have reproduced one diagram from the paper here to illustrate their approach. The reaction of most astrophotographers is one of horror - why should you wish to remove the attractive spikes. Some astrophotographers even add diffraction spikes to the images during processing. From an imaging perspective, I think the interesting "point" is in figure 9c and 9d. As well as removing the gross spike artifacts, the intensity profile of the star appears improved in (d), perhaps giving a better fwhm, i.e. tighter stars and detail. That is of huge interest to astrophotographers. I am moderately interested in starting a mini-project to try this on my own scope, but I've a few other jobs to get finished first! !